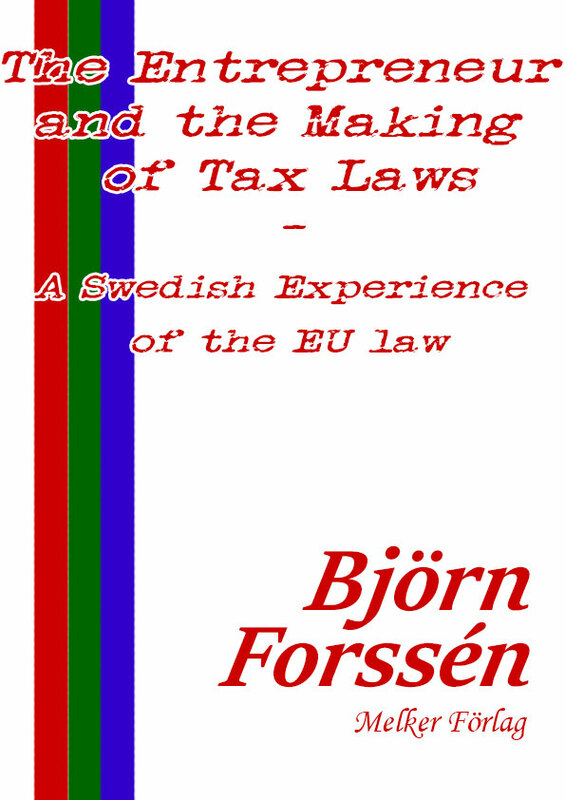 The Entrepreneur and the Making of Tax Laws – A Swedish Experience of the EU law concerns fiscal sociology aspects on the making of tax laws. It’s a new branch within the field of fiscal sociology concerning certain aspects regarding the making of tax laws. It constitutes a bridge between fiscal sociology aspects in the broader sense, i.e. regarding aspects of economics and sociology about fiscal sociology. –	Part C is about consequences thereof for the entrepreneur mainly concerning charges of tax surcharge and tax fraud. There’s also an Epilogue tying together the conclusions in Part C with those in Part A and Part B. The three parts of this book can be read separately with regard of their various themes: i.e. regarding systematic imperfections concerning the making of tax laws for entrepreneurs, communication distortions in that respect between the legislator’s intention and the perception of the tax laws and consequences thereof for the entrepreneur. In each part the theme is introduced by a history or background review and together Part A, Part B and Part C build a logical continuity on the topic of the making of tax laws. Part B and Part C are to a large extent built on the conclusions in the author’s licentiate’s dissertation in 2011 and doctor’s thesis in 2013 at Örebro University, where he analyzed some differences between the Swedish Value Added Tax Act 1994 and the EU’s VAT Directive (2006/112/EC) regarding current law on the determination of the tax subject and the right to deduct input tax etc. The third edition of his doctor’s thesis – Tax and payment liability to VAT in enkla bolag (approx. joint ventures) and partrederier (shipping partnerships) – is also published by this publisher. In that book are a couple of models – tools – to deal with the mentioned differences in practice presented. In this book are those differences looked upon as communication distortions caused by the legislator failing to transmit properly the intended taxation to the entrepreneurs as tax subjects. It’s no longer primarily a matter of establishing current law. The fiscal sociology perspective in this book concerns in the first place reasoning on how e.g. the already established differences mentioned occur and what to about it regarding the topic of the making of tax laws to avoid such communication distortions. Thus, the focus on communication distortions is set on the Swedish Value Added Tax Act 1994 in relation to the EU’s VAT Directive (2006/112/EC). However, this book may also serve as a reference for comparative studies including countries outside the EU.